In 2007, Milton S. Hershey Medical Center became the first hospital in central Pennsylvania to implant the SynCardia TAH. Hershey Medical Center has since implanted a total of 15 devices, with seven surgeries performed in 2015 alone, notes Behzad Soleimani, MD, surgical director, transplantation and mechnical circulatory support. These figures make the Institute’s volume of SynCardia TAH implantation surgery the second highest among the 64 centers that offered the implantation procedure in 2015. Hershey Medical Center has a long history of adopting new artificial heart technology, dating back to 1985 when the hospital implanted its first TAH, an air-driven device. In 1993, it was one of only three institutions awarded a three-year, $5.4 million contract from the National Heart, Lung, and Blood Institute to continue its work in developing a fully implantable electric heart. Research toward this goal focuses on transcutaneous transfer technology that would eliminate the drive-line that connects current TAH devices to external power sources and address hemocompatibility issues, which previously led to high rates of stroke in patients who received totally implantable electric hearts, says Dr. Soleimani. “We are still looking for a totally implantable artificial heart that is both hemocompatible and has no drive-line. That is the holy grail,” he adds. Copeland JG, Smith RG, Arabia FA, Nolan PE, Sethi GK, Tsau PH T, McClellan D, Slepian MJ; CardioWest Total Artificial Heart Investigators. 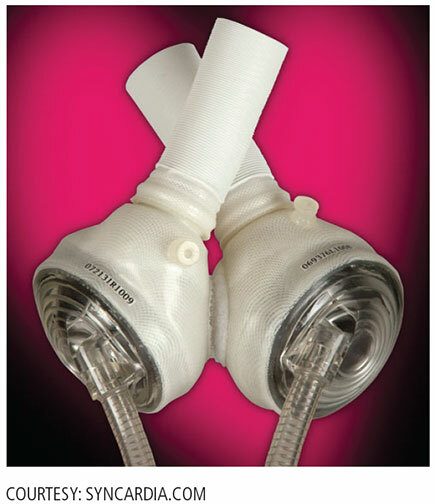 Cardiac replacement with a total artificial heart as a bridge to transplantation. N Engl J Med 2004; 351:859-867.
https://clinicaltrials.gov/ct2/show/NCT02232659?term=syncardia+70++cc+TAH+as+destination+therapy&rank=1 . Accessed February 12, 2016.
https://pennstatehersheycardioreport.org/2016/01/08/non-sternotomy-valve-surgery-eases-cardiac-recovery-for-patients/. Accessed February 12, 2016.